Born in Kentucky and raised in Wisconsin; Andy came to us on a climbing trip to the Alaska Range and loved it here so much that he never left. 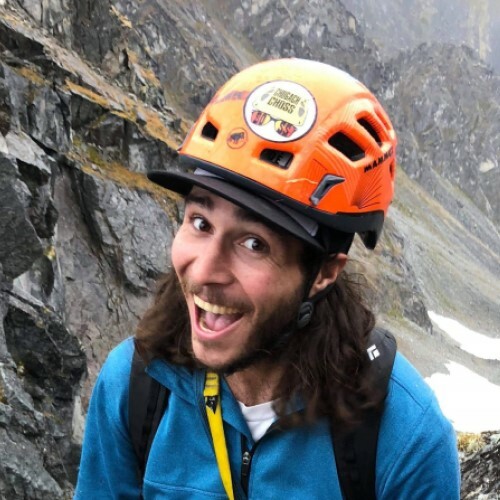 Coming from a strong background in rock climbing, he has climbed all over the Americas including splitter sandstone cracks in Utah, knife-edge granite ridges in the California Sierra, overhanging limestone in the Chilean Andes, and even the greasy quartzite tucked away in the Midwest. Whether climbing, biking, skiing, or hiking, Andy’s happiness is being in the mountains. In recent years he has been seeking out more alpine climbing objectives, especially remote wilderness climbing. Some of his future goals include objectives in the Karakoram, Baffin Island, and Antarctica. Andy also has a BA in global sustainability, speaks Spanish fluently, and has his WFR certification.